I was born in Aurora and grew up in Littleton. In high school, my stepfather, who had raised me, became addicted to cocaine and other drugs. Before my eyes I saw a man destroy his life and I realized that my life was headed in a similar path of meaninglessness, despair, and destruction. The Lord used this difficult season to draw me to Himself through a series of interactions with passionate followers of Christ. At the age of 18, by grace, through faith, the Lord made me a new creation and set my life on a new course of enjoying and pursuing Him forever. Since that time, the Lord allowed me to graduate from Colorado State University and Denver Seminary. I was married to my wife Jennifer in 1999. In 2003 I was ordained by Colorado Community Church and we were commissioned as missionaries. We served ten years at The Harbor in Okinawa, Japan in a church that served the military community stationed there. In 2013 we moved to Brno, Czech Republic to serve with Pioneers International as Church Planters. At the end of 2015 we felt called to return to Colorado to care for my wife's father who is suffering from Alzheimers. In addition to planting Redemption Parker, my wife and I still continue to serve with Pioneers International on the Europe Core Leadership Team. You can learn more about that ministry here. Since 1999, Jennifer has been my partner in life and in ministry. She is gifted in the areas of hospitality, teaching, and women's discipleship. She enjoys teaching our daughters, time in the mountains, travel, reading, blogging, and meaningful conversations with friends. Additionally, I count it as one of God's great blessings to me to call Rebekah, Zoe, Abby, and Hannah my daughters. Each of these girls have unique giftings and passions. My hope for Redemption Parker is that God would raise up an authentic community of men, women, and children who know and worship the triune God rightly, and that powered by the Holy Spirit and motivated by the gospel we would give our lives away as we follow Christ in acts of compassion, mercy, and grace. I enjoy watching the Broncos and the Lakers (I know, I know, that's not right), as well as playing basketball and tennis. In the summer, you'll often find me on our trampoline with my daughters attempting back-flips, front-flips, and other stunts no forty-year-old should be doing. I enjoy reading and discussing all kinds of books including theology, history, missions, leadership, philosophy, apologetics, pop-culture, current events, good fiction, and books I read to my daughters before bedtime. Several years ago, some like-minded Christian brothers and I began to read and review 52 books per year (www.my52books.com). Some of my favorite authors include C.S. Lewis, Os Guinness, John Piper, N. D. Wilson, J. I. Packer, and Timothy Keller. In addition to reading many blogs, for years I have blogged about issues related to our mission and ministry, social issues, philosophy, and apologetics. I am also passionate about public speaking - particularly any time I have the privilege to preach God's Word is a great joy and honor to me. I grew up in the buckle of the Bible Belt--Birmingham, AL. My family members are all strong believers and I grew up attending church, but I now know that proximity to the gospel is a far cry from belief. As a sophomore in college my grandmother bought me a 10-volume set of Charles Spurgeon sermons for Christmas. For about a year I spent hours each day reading his sermons. His confidence and his belief caused me to begin looking at the Scriptures for myself. One night, as I sat on the ugliest purple dorm room couch you can imagine, I was reading a Spurgeon sermon on Ephesians 2. The Holy Spirit opened my eyes to the sin and depravity of my heart and then to the grace of the gospel of Jesus Christ. I got on my knees, confessed faith in Christ, and have followed him since. Following college, I attended Beeson Divinity School and also served as a preacher, Bible-study leader, and deacon for Iron City Church. Lauren and I got married on August 12, 2017. Lauren is kind, gentle, a gifted writer, and has an infectious love for God’s Word and His Church. Being married to her is the biggest blessing of my life. When I’m not reading, Lauren and I love to run, hike, or go for a ride on our long-boards. We can’t wait to try all of Colorado’s outdoor activities! I am happy to be serving at Redemption Parker, encouraging the church to be obedient to the Great Commission and to reach their community with the Gospel of Jesus Christ. I was born on March Air Force Base, in California in 1976. My dad was in the Air Force and we moved several times until we finally ended up in Arizona. I grew up in a Christian home, went to Christian schools, and was at church every Sunday and Wednesday. By the time I graduated high school, I thought I had the Christian life figured out (and didn't really need or want anymore). However, during my Freshman year in college, I encountered a cult who really shook my faith. I did not have the all of the answers, and quickly found out that knowing the right answers was not enough. God used this time to show me that what He was really asking for was my whole life in obedience to Him, not just knowing the right answers and saying the right “Christian” things. This is when I really started following Christ. During this time, I met and married my wife, Sandie, and graduated from college with an Engineering Degree. Sandie and I moved to Tuscon,AZ started our family, and I worked as an Engineer. Although God uses many experiences and circumstances to conform me to the image of Christ, there have been a few key moments in my life that highlight this ongoing transformation. One of these moments came a few years after graduation, just as I was settling into life as an Engineer. I was successful at my job; we had a new house, and a new truck. I was in full pursuit of the “American Dream.” Then God decided to show me that my heart was pursuing the wrong things. We were involved in student ministries at our local church when the youth pastor left the church suddenly. I had no intention of changing my vocation, but it became clear that this was what God was asking me to do. God used this experience to reveal my heart and priorities. So I quit my Engineering job and became a youth pastor. God used that year in many ways to shape me to be more like Him. A year after that, God moved us to Phoenix, and I took a job as an engineer again. We found a great church, and became very settled into our life in Phoenix. We were involved in leadership at our church, leading the young adults group, and growing our own family (with 4 kids, and one on the way). Again, God asked for my obedience. My sister's husband was leaving her and her 4 children, and God was asking us to relocate to Colorado to help her. We started praying that God would make a way for us to help, and within 3 months, He answered our prayer with a work opportunity that would require us to relocate to Colorado. This was one of the best times in our lives. We learned that being in the will of God, doing His work, living on mission was the only place we wanted to be. After 2 years, we moved back to Arizona, hoping to start right back up where we had left our lives in Arizona. God had different plans, and the Engineering Company that I worked for in Phoenix was relocating everyone back to Denver! It was a hard decision, but after much prayer we really believe that God was calling us to go back to Colorado. So we packed up again, leaving our church family, friends, and Sandie's family and moved to Parker, Colorado. We are excited to see what new work God has in store for us here as we seek His will for our lives here in Parker. Sandie and I have been married since 1999, and have 5 children; Cole, Ethan, Blake, Grace and Lucy. Sandie and I believe that as followers of Jesus, we are called to make disciples, and that our 5 kids are at the head of that line. Especially as our kids get older and start entering their teen years, we definitely feel a sense of urgency in teaching our kids how to follow Christ. We strive to live as a family on mission in our neighborhood, work, and schools. One of our greatest hopes for Redemption Parker is that God uses this church to grow and mature believers to live on mission so that we can reach Parker with the Gospel message. I am excited to see us reach Parker by becoming a group of people that learn to be more intentional in our relationships both with believers and unbelievers as we build community together. Growing up I loved basketball and my favorite team was the Phoenix Suns. I thought that Dan Majerle was the coolest. I still play now and then, but now that I am getting older, I have transitioned to some more old man sports, like golf. Also, now that we are in Colorado, we are enjoying more outdoor activities we can do as a family like hiking, camping and snowboarding. No 14ers yet, but who knows, maybe this is the year! My wife and I also enjoy working on home projects. We have done everything from kitchen and bath remodels to landscaping and even building a pool. We always seem to have a list of about 20 projects to work on. I blame Pinterest and Fixer Upper for both the fact that my list is so long and that I know what shiplap is. I was born and raised in Colorado, and grew up in Parker. I have always had a passion for music and in my youth I first fell in love with the Gospel through song. I spent many years in and after high school serving with my local church in worship and youth ministry. In October 2016, I married my wonderful and beautiful better half, Caylee, and we currently live in Parker with both of our families close by. In the fall of 2017, I was drawn to Redemption Parker and have loved being a part of the family here ever since. I like getting outdoors and doing nerd things. Sarah: Working with children has always been a passion of mine. I graduated from Corban University, a small Christian school in Oregon, with a Bachelor’s in Early Childhood & Elementary Education. After graduation, my husband Michael and I moved to Colorado and I taught here in Parker for six years. In June of 2018 our first child, Titus, was born and I made the decision to take a break from full time teaching. In our free time my husband and I enjoy being very active. Some of our favorite hobbies include rock climbing, hiking, going to the gym, and camping! Ultimately, we just love getting out and enjoying this gorgeous state we now call home! Molly: I am a wife, a mom, a coach and an "on-hold" kindergarten teacher while I stay at home with my littles. I am blessed to continue my passion for teaching by serving Redemption Kids. Besides education, I love anything fitness and encouraging others towards pursuing strength and finding priority in their health. The Finke Family is happy to call Parker home after years spent living in various places primarily across the Midwest. Married for 13 years, they have 3 children, ages 8, 5, and 1. Joe and Whitney believe Gospel Communities are a great place to develop meaningful relationships, as well as provide opportunities for discipleship and serving the local church in our everyday routines and rhythms. Joe and Whitney both enjoy spending family time together in the mountains, as well as traveling to new places. As the daughter of an Air Force pilot, I grew up between four continents and eight states. I don't have one place to call home, but I've realized that home is where there are people that I love and am loved by, so by God's grace I have so many homes! My transitional childhood developed in me a deep love for culture, missions, and people, which led to me to pursue a Masters of Arts in Christian & Intercultural Studies from Southeastern Baptist Theological Seminary after graduating from the University of Alabama with a degree in Youth and Adolescent Development. My husband Matthew and I married in August of 2017 in Birmingham, Alabama and six months later made the big move to Denver, Colorado to join Redemption Parker. I have a deep love for encouraging God's people through writing on my blog and through discipleship. I enjoy coffee, the mountains, and good books (preferably all at once). I am a native of Denver, Colorado and married my husband Mark at the scandalously young age of 20. After the honeymoon, finishing school, and seminary, we served with Cadence International as missionaries in Okinawa, Japan. There we ministered to American service members and their families. One decade and four daughters later, we transitioned from Asia to Europe. There we served with Pioneers International as church planters in the Czech Republic, where the Evangelical Christian population numbers less than 0.5%. In 2015, we were unexpectedly called off the mission field to care for my dad who suffers from Alzheimer’s and Dementia. We now reside in Parker where we have planted Redemption Parker with the team of dear friends and amazing leaders you see here on this website. In addition to RP, Mark and I remain on staff in a supporting role with Pioneers International. Outside of missions in Europe and church planting in Parker, I homeschool my daughters and write at jenoshman.com. I am especially passionate about encouraging women in deepening their faith and growing a Biblical worldview. I was raised in Phoenix, AZ, met Brad my senior year of high school, and married him when I was 20. We have 5 children, 3 big boys (ages 12, 14 and 16) and two little girls (ages 6 and 10). I homeschool my 4 youngest children. When I'm not teaching, I love cooking dinner for a big crowd—seeing 30 people scattered around our kitchen and dining room enjoying the food and friendship makes me happy. Brad and I love game nights with friends and are always knee deep in a home project (he looovvves my Pinterest DIY Board). I love to read good books, am borderline obsessed with my garden, and get super excited about any home project wherein I get to use a power tool. I do not think that we as women can “do it all”—you will never see me running a marathon (bless you if that is your gift!!) and I am not fancy (at all), but I do try to give my time, talent, and treasure to what matters most—loving God and serving others well. My husband Kenton and I have a new son, Julian, who was born in October of 2017. I graduated in 2010 from the University of Northern Colorado with a Bachelor's in Spanish and a minor in Sport and Exercise Science: Youth Development. I met Kenton my senior year through InterVarsity Christian Fellowship and got engaged after I spent a year in Panama doing college ministry with IFES comunidad de estudiantes cristianos. We got married in 2013 shortly after my return from Panama and stayed in the Denver area. We were both involved as leaders in youth ministry at our past church until coming to RP where we got involved with the worship team. I work part time from home and I am passionate about working with youth and young adults, playing frisbee (golf or ultimate), hiking, or anything outdoors. I am currently training for a half marathon! Also, a new and fun hobby of mine is brewing kombucha from my own kitchen. The Dugas family is originally from Phoenix, AZ. Brad and Sandie were both raised in Christian households and started following Jesus in their teens. They met in high school, married in college, and spent most of their lives in the dessert. It was hot—and not in the good way! They moved to Parker, Colorado 3 years ago and love it. They have 5 children, ages 6,10,12,14,and 16. They believe in the importance of making disciples and their children are at the head of that line. They strive, as a family, to live on mission in their neighborhood, work, and school. Brad and Sandie love to have people in their home to eat, hang out, and open God's word together. One of their greatest hopes for Redemption Parker is that God would use this church to grow and mature believers to live on mission so that we can reach Parker with the Gospel message... plus, they just like to have people over to party! Transplants from California and Wisconsin and married for 5 years, Kenton and Jaimie welcomed their son, Julian, in October. With all their family out of state, they are excited to see Julian grow up knowing those at Redemption Parker as his family. Having worked mainly in youth ministry over the last 5+ years, Kenton and Jaimie hope to use their home as a hub for serving and shenanigans to grow the kingdom of Jesus here in Parker. They see Gospel Communities as a natural and organic way to share the Gospel with their neighborhood the way Jesus did, in the homes of his disciples over food and drink. When parenthood allows, Kenton and Jaimie can be found playing any number of sports, with their most recent interest being Disc Golf. 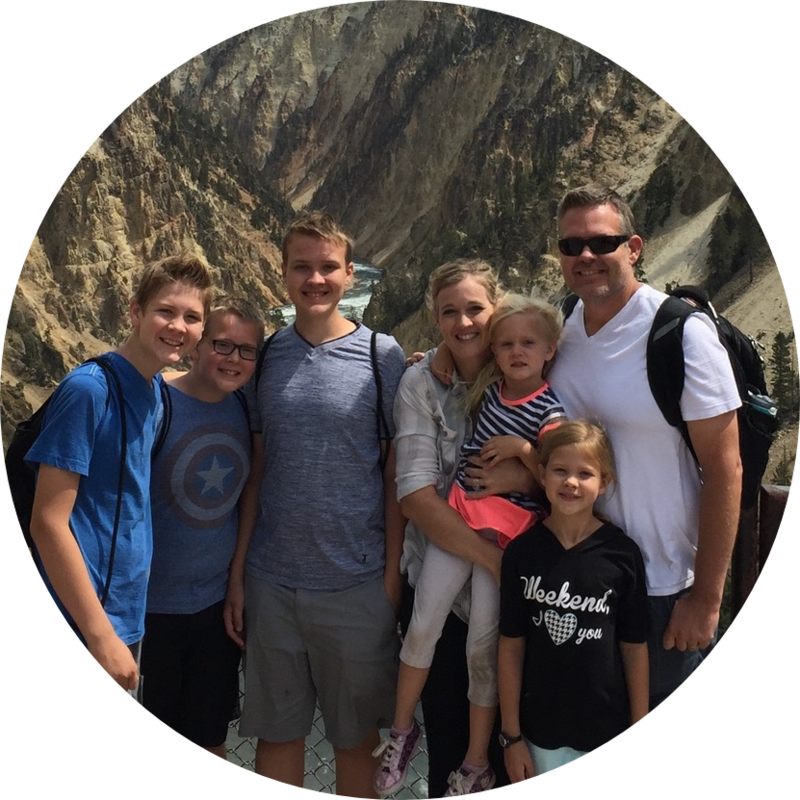 Mark and Jen are Denver natives, have been married for 19 years, and have four daughters ranging in age from 10 to 20 years old. They’ve lived overseas as missionaries for 15 years and have been back in Parker since late 2015. They have found it a great joy to plant Redemption Parker along with the other amazing leaders you see on this page. Mark and Jen love opening up their home to neighbors and RP friends and family. They especially enjoy serving up smoked meats, authentic conversation, and sometimes hijinks. You never know. Mark plays tennis and basketball, Jen can be found doing cross-fit with the ladies in her neighborhood, and they both love to read and communicate Gospel truths through speaking and writing. Mike and Susan are Illinois natives and recently celebrated their 40th wedding anniversary. Besides Illinois, we have lived in North Carolina, Tennessee, and in 2016 we called Colorado home! Our four grown children and eight grandchildren have blessed us beyond measure and we are pleased to have two of those families here in Colorado with us. Not to mention our two dogs, Teddy and Vinny. Susan came from a Catholic upbringing and Mike a Lutheran. We met while Mike was in college, Susan’s brother Kevin was Mike’s roommate. Go figure. In September 1983, we both gave our lives to the Lord Jesus Christ. Baptized in the faith, we both have served in many capacities for the Kingdom. From Children’s Ministry, home group leaders, men’s group leader, elders and co-founders of the Women’s Hope Center, Mt. Vernon, IL in 1991. Redemption Parker has become home and we are excited to be co-leading the Castle Rock (The Crock) Gospel Community with the Bowermans. Stewart and MaKayla are recent transplants to Parker from the midwest. Stew grew up in Minnesota and MaKayla in North Dakota. They met at a small Christian college and got married just before their senior year. In December of 2017 they relocated to Denver and have loved every second of it. Stew works in business development for Zoom Video Communications. MaKayla works for a consulting firm in Minnesota called Dahl Consulting as an Accounting and Finance recruiter. Stew likes playing tennis in his free time and MaKayla volunteers with Young Life. They love squeezing as many people as they can into their home and have two friendly kitties (Simon and Finn).